When it comes to interior decor colours, none are more exciting than modern water colours. Water colours can be colourful without being over-powering! 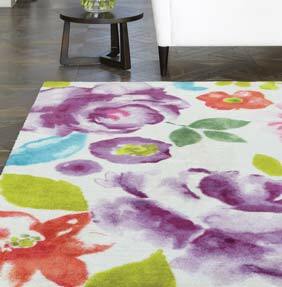 Ideal for freshening up a living-space for spring or adding colour to a dreary day. Our beautiful art inspired Boca range features a mix of sophisticated floral and geometric designs, all featuring pastel / water colours. Boca is handmade in China from 100% acrylic, the pile is soft and smooth to touch. Available in 12 patterns and 2 standard sizes.